By adopting brass material of high specific gravity metal, plays clear and solid bass sound by suppressing the resonance within earphone cabinet. 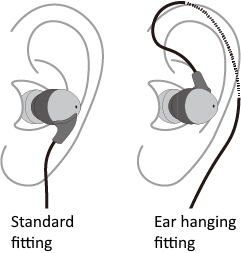 Normal wearing, ear mounted, both OK for 2WAY mounted model. Ear reduce the touch noise in the mounting. Also recommended during exercise. Adopt a patent tornado equalizer method of music sound tea in acoustic technology. Canal type of ringleader of sound quality degradation, reduces the resonance in the vicinity of 6kHz caused by blocking the ear canal. OFC Ritz wire × 4 core configuration.Less cable tangling problems by adopting spiral cord. Versi baru dari “BEST SELLER” Co-Donguri [SHIZUKU] dengan bass yang lebih kuat dan suara bening seperti pendahulunya. Tonton video review kami untuk tips tuning Co-Donguri Brass.